You’re visiting the beautiful Texas Gulf Coast and you want your stay to be a great one. That’s why you’re choosing the Stella Mare RV Resort. Even if you haven’t already made the decision, we’re sure you will. That’s because the AAA combination of Accommodations, Attractions, and Amenities will seal the deal for you. The Stella Mare RV Resort has the accommodations you need. All sites have a 70’ or 90’ concrete pad, a concrete patio, green space and landscaping. Any size pull-through can be accommodated and six guests are allowed per RV site. You can even get double parking. You’ll find full RV hook-ups with 30 and 50-amp power at every site. Sewer hookups and waste disposal outlets are stationed throughout. It is the Texas Gulf Coast. What more could you ask for? The beach is gorgeous and offers the opportunity to get in some great time with the sun and just relax away the day. Perhaps you’re more of a mind to experience the Gulf through sailing, fishing, or swimming. If the beach and the Gulf aren’t enough for you, consider visiting the Strand and the Spot, where you’ll find a host of tourist attractions that include museums, boutiques, theme parks and restaurants. When you’re staying at the Stella Mare RV Resort, you have many amenities to enjoy as you relax in your downtime. 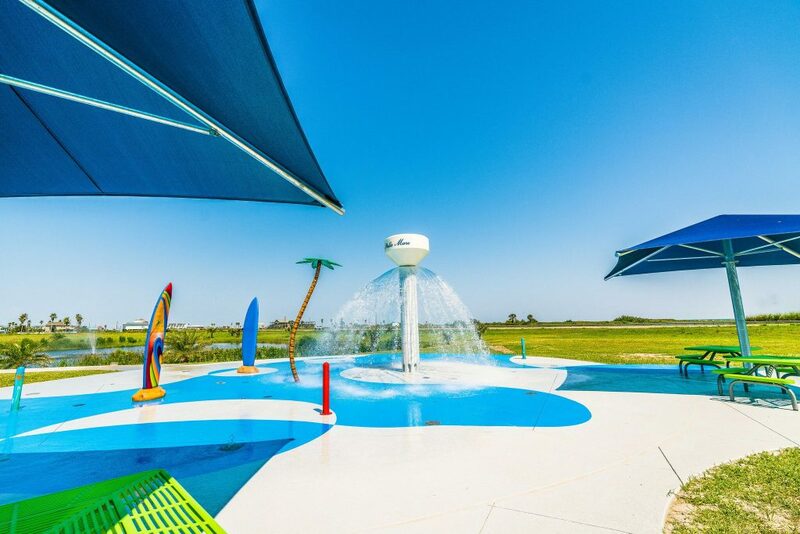 There’s the largest splash pad offered by any RV resort on the island, a swimming pool, hot tub, and elevated deck. You can also have the kids play on the multi-activity playground while your pets are playing in one of the two dog parks.